SculptureCenter has been an active contributor to New York City's cultural community since 1928. Originally founded as "The Clay Club" by Dorothea Denslow, SculptureCenter renamed itself in 1944 and in 1948 moved to a carriage house on East 69th Street in Manhattan. Here it established a ground floor gallery space dedicated solely to sculpture with workshops and studio space on the upper floors. Over the course of the next half-century, as the field of sculpture expanded and evolved, SculptureCenter’s exhibition and education programs have as well. 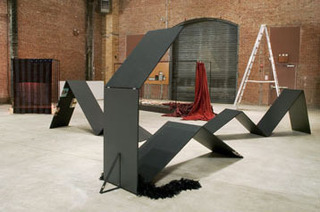 In 2001, SculptureCenter purchased a former trolley repair shop in Long Island City, Queens. This new structure, which is being redesigned by artist and designer Maya Lin, will include 6,000 square feet of interior exhibition space, offices, a work studio and apartment for visiting artists, a sculpture library and a 3,000 square foot outdoor exhibition space. SculptureCenter’s new facility opened to the public in December 2002, after completion of the first phase of building renovation.